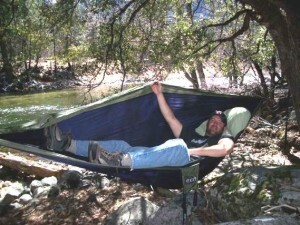 Eagle’s Nest All Weather Hammock: A sleepy way to relax! Lounging the day away besides a lazy river. Sing it Taco! All you need are two trees and a tired spirit to enjoy the ENO hammock. The hammock we reviewed is simple, comfortable, strong, and met all of our requirements to be deemed worthy of your hard-earned dollars. No amount of ingenuity or mechanical wisdom is needed to set up the hammock. I am a complete idiot when it comes to mechanics, but this hammock was as easy as making the bed in the morning, and takes about the same amount of time. We civilized and uptight Americans work too hard and rush too much; we sit in our cubicles and calculate, file and figure ad nauseum. Our lives are void of nothingness, empty of the rich state of doing nada. If you can force yourself to sit in this hammock, it will lull you into a deep and necessary complacency; you will be unable to get up and do every busy little thing you insist on doing. It could have been called a chair, a bed, a womb, but Eagles Nest is appropriate because the hammock is like a cozy nest. When you get that sweet spot in the hammock you may lose your way back to nine to five. Man’s language, even Shakespeare’s English, cannot convey the shedding of nerves my frazzled spirit experienced when rocking in the ENO Hammock. Put your weary soul in this cocoon and you will be soothed into a tranquil state. The suspension, rocking and perfect envelopment of body will sooth with delicate deliberation and your soul will emerge renewed from beneath that stack of tax papers, those long rows of smoky cars–threats to your over-worked spirit. 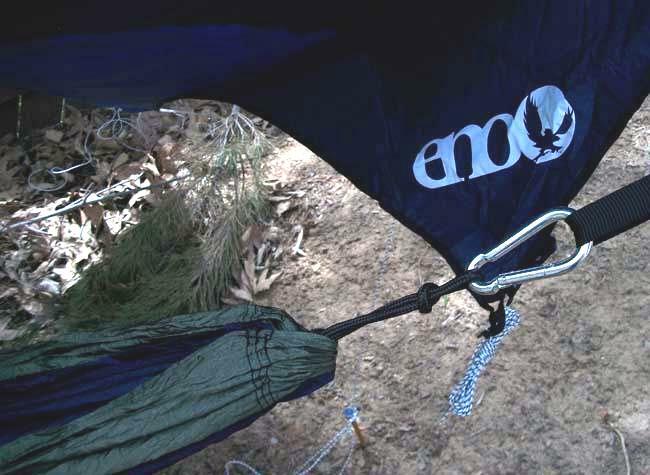 Eagle's Nest Slap Strap protects the tree trunk from rope burn while ensuring a solid anchor point for your hammock. We tried an unconventional testing pattern. We hung the hammock up at a park between two pine trees and had random people sit and lie down in it; a stressed Boeing executive, an overworked engineer, a twenty hour per week commuter, a tired blue-collar worker. The consensus was unanimous; each had to be forced out kicking and screaming after very long stretches of lounging. “Just give me my New York Times and I’ll never get out,” one woman said. “Oh. Oh. Oh,” another oozed. “I didn’t realize how exhausted I was. This is amazing,” one man said. The above are some of the typical testimonials we heard from our park friends. The importance of stopping is under-rated, and the hammock facilitates that deep necessity. ENO all season setup offers overhead protection with a rainfly. The hammock is very small (4 lbs. 8 oz. ), and can stuff easily in a backpack. Trees should be about ten to sixteen feet apart and it is best with a pillow. Safety is of great importance and ENO’s top concern; the fabric is constructed of breathable nylon micro fiber and is sturdy and durable; the hammock holds up to 400 lbs. 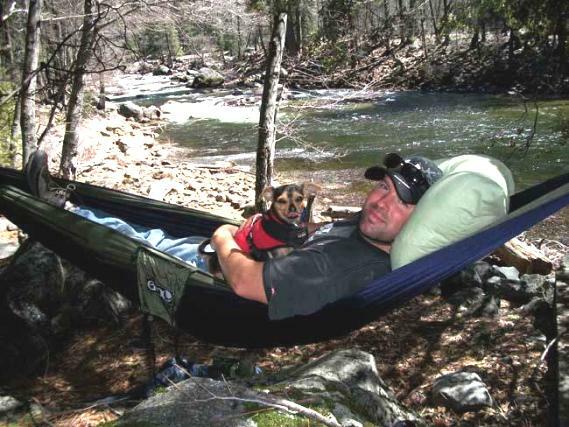 The Slap Strap hammock suspension system is strong and is resistant to the wear and tear of the elements. The stitching and fabric are top rate and the entire system is safe, sturdy and secure; it is never flimsy. It is simple to set up; there are two heavy duty straps (Slap Straps) with nifty loops. These straps are simply wrapped around a tree and inserted through one of the loops. The hammock has steel carabineers that are attached to each end; these carabineers clip to the straps; the hammock sets up in three minutes. The rain Dry Fly Tarp is hung separately over the hammock and is almost as simple to set up as the hammock. Two ends tie to each of the trees then you can stake up to three points on each side, six in all. The rain Dry Fly Tarp is versatile; you tie it with strength tested nautical grade line, and are free to arrange the lines as needed depending on the direction of the rain or sun. 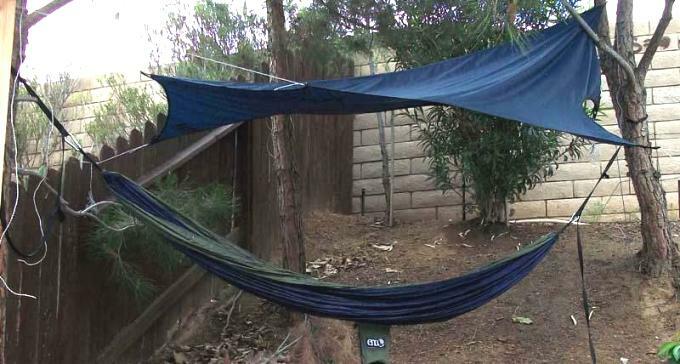 Eagles Nest two-person hammock with rainfly and its semi-permanent location in the back yard. We tested in pouring rain and blistering sun, and it kept the water and the sun out beautifully. The rain Dry Fly Tarp was easy to set up and take down, but all of the lines became annoying. A toggle on each line to help manage them and prevent them from getting all jumbled up would help. The ENO Hammock rain Dry Fly Tarp was a perfect sun shade at the beach; a perfect rain tent in the mountains. The owners of the company, Peter and Paul Pinholster, are free spirits, and their original business model was based on hippy principles, not corporate bottom line. They wanted to develop a product they loved, would speak to their customers weary souls and allow them (Peter and Paul) to sell at music festivals and community gatherings on the East Coast and along the Appalachian Trail. The hammock’s design and comfort reflect the owner’s free-spirit mentality. The company grew bigger and now the business thrives in the Blue Ridge Mountains. While camping, the hammock was fought over by the whole family. The Double Nest Hammock seats two folks side by side or reclining, and is very comfortable with two people. My first thoughts were, I don’t want to be that squished with anyone in the hammock, it looks uncomfortable, and it looks like there would be no room to move….and I am afraid of flipping! But to my great delight, I was dead wrong. Like children, my husband and I hooked up the hammock and dove in, book and beer ready in the necessary and ingenious side pocket. Thank you inventor of awesome pocket to hold all things needed to relax. No searching for a tall rock to set beer or magazine on. No reaching and stretching to get pen and paper out of the dirt below. We used the hammock as a camp chair and recliner. It was preferred to any camp chair on the ground. My favorite place for the ENO Hammock is not in the woods or by the beach, but in my backyard garden where my hubby and I drink a beer and snuggle like glorious teenagers. I can think of no better reason to recommend this product. The ENO Hammock has all of the physical properties of value, strength and reliability to recommend it, but it also has ephemeral qualities that aren’t so easy to capture in an article. This ENO hammock instructs in the art of doing nothing; it facilitates the necessity of decompressing, and it forces relaxation. In this Coffee, Commute, Computer Era, we at FreshAirJunkie.com think those traits are the ultimate outdoor product qualities. All products carry a two year guarantee.